I saw a sink like this once in a magazine – but this is the first time I’ve seen one live. Yes, that is a LIGHT connected to and running horizontally along the sink! The seller says that it works perfectly. How cool. I presume the covering over the light itself is impervious to water. Hi Pam, Great site! I have a similar sink and it still works. My sink has 3 basins, 2 large on the outside with one smaller/shorter in the middle. The faucet handles are also in the middle. 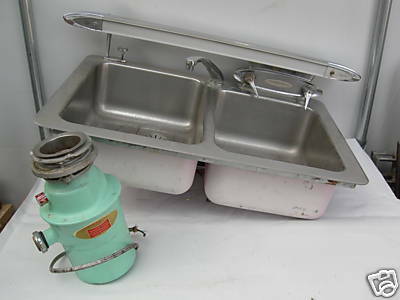 I was wondering if you knew anyone who may be interested in it or have an idea of the value of the sink. I can send a pic if you wish. We live just outside Milwaukee and are remodeling our kitchen this week.